Even though there are only two boys volleyball programs in the area, the players on this year’s All-Herald Boys Volleyball Team have proven themselves capable of playing with anyone from the state. With both local teams full of so many good players, the only problem comes down to which ones to select. Newington claimed its fifth Class M championship in the last seven years, and the program has routinely produced some of the best players in the state. As it did last season, the Indians had a number of strong contributors to choose from and four of those top our team. Dan Cloutier appears on the All-Herald Boys Volleyball Team for the first time. Being just a two-year volleyball player, Cloutier has learned a lot in a short amount of time. This season he was named CHSCA Boys Volleyball Player of the Year as well as gaining all-CCC and All-State honors. As a setter, he helped lead his team to the conference title, and as the head of the offense, he recorded 795 assists, 16 aces, 107 digs and 45 kills this season alone. In the fall, Cloutier will be attending Bryant University where he will be playing club volleyball. Louis Egbuna was a force in front of the net for the Indians. In 109 sets played, the outside hitter collected 272 kills, 14 blocks and 37 aces. He was awarded all-conference. With the top hitting percentage and kills in the state, the junior is already being recruited by Loras College. Two-sport junior Teddy Fravel is also making an appearance on our team for the first time this year. Standing 6-foot-7, Fravel has the highest vertical leap (11-feet, 6 inches) in Newington volleyball history. He uses his height as an advantage on the court. He recorded 72 total blocks and 25 solo blocks this season. He also had 198 kills and four aces. Junior outside hitter Leonel Caceres was another all-conference player for Newington. Caceres had 361 kills, 131 digs, 45 aces and had a .247 hitting percentage. Southington again made it to the Class L tournament quarterfinals and claims the final two spots on our All-Herald squad. Junior Tim Walsh was a key outside hitter for the Blue Knights, improving his play drastically from last spring. Walsh was named All-State first-team, notching 271 kills, 222 digs, 17 blocks and 51 aces this season. Senior setter William Pfanzelt recorded 281 assists, 28 aces, 149 digs and 164 kills in 72 sets played. The senior was also named all-CCC. 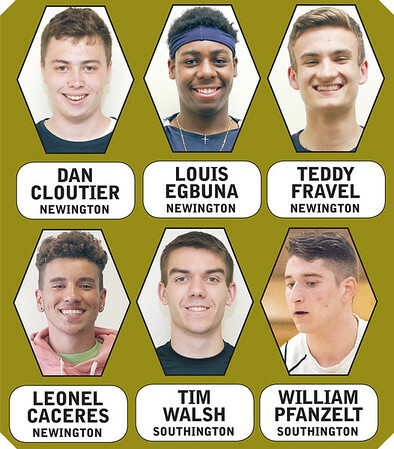 Two teams may not appear to have very many choices when selecting an all-star squad, but Newington and Southington produced some of the best Connecticut had to offer in 2018. Posted in New Britain Herald, Berlin, Goodwin Tech, Innovation, New Britain, Newington, Plainville, Southington on Friday, 13 July 2018 22:10. Updated: Friday, 13 July 2018 22:13.